I'll post again as this project develops....(or,caves in....lol). Dryden-Tdub, TWilight, jtomelliott49 and 4 others like this. The TW has 33 mm tubes and there are few dirt bikes that use that size. The TW triple clamps could be bored to fit 34 mm which opens up a few mx possibilities but if the triple clamps can be bored to 35 mm that would really offer a lot of possible choices. I don't know how much the clamps can be opened up but a good machine shop (or 3) could give their opinion. TWilight, Dryden-Tdub, jtomelliott49 and 1 others like this. Yup, almost no bikes with 33mm tubes. 33 Honda TLR-200 (86-87) "Reflex"
33 Yamaha TW-200 T/TC/U/UC/W/WC/A/AC/B/BC/D/DC/E/EC "Trailway"
33 Yamaha TW-200 F/FC/G/GC/H/HC/J/JC/EK/EKC "Trailway"
TWilight, Miaugi, badcat and 1 others like this. Twelve rules will get you through life with style. Not all those are dirt bikes though. Since the reason to replace the forks was to install better suspension I discounted street bikes. But I wouldn't bother with them. Really the old CR, YZ, KX, and RM are the only candidates. 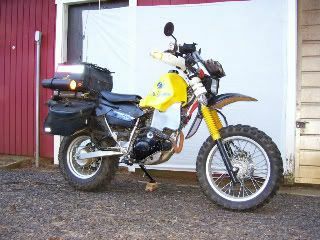 I am using RM 85 forks (2005 USD) on my XR200 because they are a huge improvement. "...Really the old CR, YZ, KX, and RM are the only candidates...."
They're certainly the most obvious candidates.....Going back to the mid-70's MX models such as the YZ 125 and similar.There are other possibilities from 'back then',such as Betor(Bul/Ossa),Marzocchi,Ceriani,etc. Many of the "serious" forks were 35mm diameter,but it looks to me that the TW triple clamps can be enlarged to that dimension if need be. Unfortunately, there are discrepancies between the stated factory specifications and the those found on the published lists of forks by diameter,but the lists are helpful nonetheless because they provide the basis from which to research the fork a bit further. Last edited by Landser; 10-25-2015 at 07:29 AM. Some progress....early Suzuki RM 80's used both 32 and 33mm tubes. I have a set of 1974 Yamaha MX250 forks-34mm- now also. I read lizrdbrth (sp) old post about his use of RM80 tubes w/ TW lowers resulting in an increased overall fork length but no increase in fork travel.....I'm left to wonder why he didn't use the entire RM80 assembly........axle diameter difference perhaps? Had my stock triple-tree bored to 34mm and went with the early model Yamaha Tri-Z fork. Kind of a fringy experiment, but it has worked out great for me. I would not feel comfortable boring to 35mm. Tiny Wheel, a forum member in Alaska installed the complete front end of the Tri-Z trike on his TW. Last edited by Gerry; 11-06-2015 at 09:08 AM. Landser and Old n dirty like this. "....early model Yamaha Tri-Z fork..."
What gasket and o-rings i need to replace?